Tom Champeau, John Dinnis, and Mike Kirkhart presenting Hall of Fame Winner, Porschia Gabrielse, with one of her three mounts for this season. TrophyCatch Season 3 ended on a very positive note, and Season 4 is off to an even better start, with peak fishing time right around the corner. 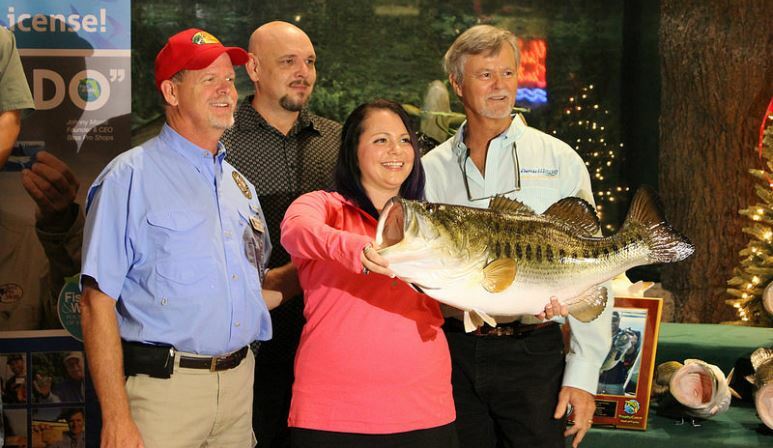 TrophyCatch is the citizen-science program that allows the Florida Fish and Wildlife Conservation Commission (FWC) to collect data on largemouth bass heavier than 8 pounds. In return, corporate partners reward anglers for properly documenting the catch with a photo of the entire bass (head to tail) on a scale with the weight showing, and releasing it. Check out these trends to find your own trophy bass. Data has shown FWC biologists that while there are hot lakes, like Kingsley Lake in Clay County (which has limited access to the military and homeowners), numerous catches come from small urban or rural ponds or even golf course ponds. Large popular public lakes like Istokpoga, Tohopekaliga, Okeechobee and Kissimmee provide equal opportunity for all anglers and are popular tourist destinations. At TrophyCatchFlorida.com you can search for catches by county or water body to determine how your favorite area is doing or where to try next.